Composer/guitarist Michael Bocian is joined in these haunting, jazz-inflected contemporary improvisations by Oregon's Paul McCandless, Spyro Gyra's Dave Samuels along with David Darling, Joe Lovano, Billy Drewes, Kenny Werner, Larry Porter and Judith Silvano. "Both content and technique are smashing." 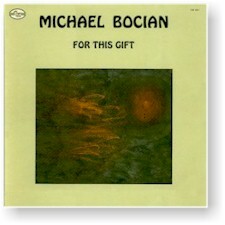 All compositions by Michael Bocian. Recorded on May 8, 12 & June 16, 1980 at Nola's Penthouse Studios in New York.